Gemma Todd's recent blog post about a surprising inability to reel off the names of women sci-fi authors has led her to start Read Along: Women and Science Fiction. 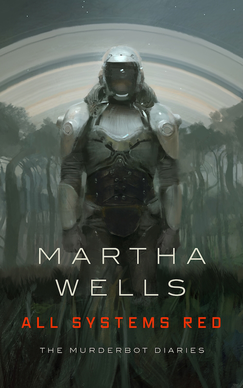 It starts on the 30th of April (not the 18th, as I previously mentioned) with the first book selected through Twitter poll being Martha Wells' novella, All Systems Red. The choice was between that, The Fifth Season by N. K. Jemisin, and Woman on the Edge of Time by Marge Piercy. The rest will also be chosen through polls on Gemma's Twitter feed, so keep an eye open. Since I'm already only reading books by women and an avid science fiction fan, I'm definitely joining in. Luckily for me, the first book is available DRM-free from Kobo (since it happens to be published by Tor). For the other books I may have to work out some substitutions, but I'm sure there'll be plenty of other DRM-free titles along the way. If you fancy joining in, follow the #ReadWomenSF tag on Twitter, keep an eye on Gemma's blog, and get reading!